Who would have thought seven to eight months into DeflateGate all of the “Tom Brady’s balls” jokes would still funny? I even found a way to get Robert Griffin III into the joke, while using the words “inflated” and Brady in the same sentence! While I am still suspicious of who said that Brady was ever considering a settlement for a shorter suspension, I am proud of Brady today. Good for you, Tom Brady. Do not let the big, bad NFL – who is not even really that big or bad when it comes to handing out punishments – try to talk you into taking a two game suspension while admitting guilt. Judge Berman also said a decision will be made sometime between Tuesday and the self-imposed deadline of Friday, September 4. All of this is great, but now its official: DeflateGate will come down to a judge’s ruling and will definitely have huge implications on the future whichever way he rules. As I said in the earlier post on DeflateGate, I think Brady had to know the footballs he was using were on the under-inflated side compared to others. Best case is Brady instructed the ball boys that he liked them less inflated and it was the ball boys doing putting them lower than the rules allowed. Worst case is Brady and the ball boys had a wink-wink, “make the balls how I like them” thing going on, meaning he knew he was breaking the rules. Unfortunately we may never know what was actually going on, but this would certainly make a great 30-for-30 in 15 years. Either way I do not think Brady should have been suspended, considering it seems like other teams also bend the rules. It just so happens the New England Patriots got caught. Oh yeah, a similar sort of tampering with footballs happened just last year, and the NFL’s reaction to it was very different. I think Judge Berman will rule in favor of Brady, meaning he will not serve any suspension. While it would be a huge blow to the NFL, we all know if anyone could easily survive something like that it’s the good old National Football League. It could be worse for the NFL: the ratings for the 2015 season opener between the Patriots and the Pittsburgh Steelers will be through the roof, whether Brady is on the field or not. RGIII’s final days in Washington? After some very interestingly-timed medical reports this weekend, Robert Griffin III was held out of the Redskins third preseason game. Griffin was expected to play, and some were calling the game the biggest preseason game in RGIII’s career as he fought to keep the starting quarterback job. Well, that’s gone now. Head Coach Jay Gruden announced today Kirk Cousins will start week 1 and beyond for the Redskins. I am happy that Cousins will get the chance, after waiting his turn, to prove that he can be a starting quarterback in the NFL. But what does this mean for RGIII? The injury-riddle quarterback was bitten by the injury bug maybe one too many times in D.C. I believe RGIII has played his last game in a Redskins uniform, mainly because of the large salary he will be paid next season if he is still on the team. Do you think the Redskins regret picking up Griffin’s option for the 2016 season that will cost them 16 million dollars? 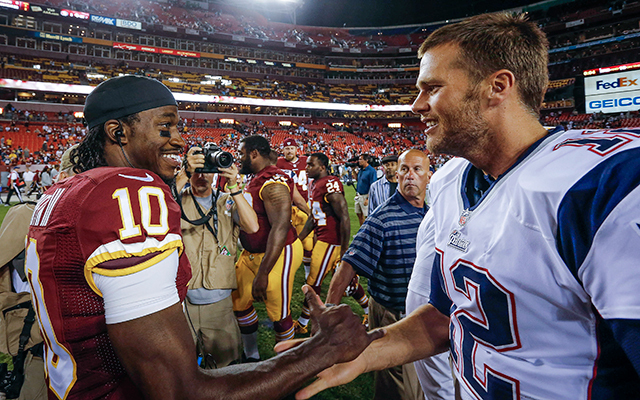 It is hard to imagine RGIII will get cut, but crazier things have happened in the NFL. I have said all along if RGIII does leave Washington I could see the crazy head coach of the Philadelphia Eagles going after him. He fits everything Chip Kelly wants in a quarterback: mobile, great hair, always battling injuries and was a great college player. Maybe Griffin is a year too late, as it seems Kelly has found something in Bradford after the third preseason game for the Eagles against the Green Bay Packers. The New York Jets should always be in these discussions, and I think RGIII in New York would definitely make the Jets better. The underlying second part to that statement is if he can stay healthy, which might always be the thing that leaves people wondering, “what could’ve been?” about RGIII. This entry was posted in Home, NFL and tagged Andrew Brandt, Bill Simmons, DeflateGate, Judge Richard M. Berman, Kirk Cousins, New England Patriots, New York Jets, NFL, no settlement, Philadelphia Eagles, RGIII, Robert Griffin III, Roger Goodell, suspension, Tom Brady, Washington Redskins. Bookmark the permalink.